Welcome to the IONS® Balvanyos 2017 conference official website! The International OSA Network of Students (IONS®) represent large-scale networking conferences “organized by students, for students”. 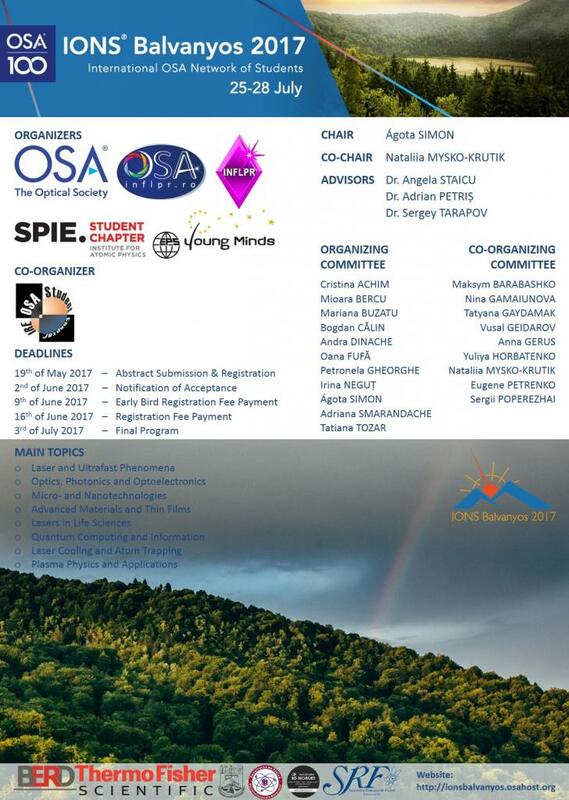 One of the 2017 European meetings is hosted for the first time by the Romanian OSA and SPIE Student Chapters as well as the European Physical Society (EPS) Young Minds Section of the National Institute for Laser, Plasma and Radiation Physics (INFLPR), and co-hosted by the Ukrainian OSA Student Chapter of the Institute of Radiophysics and Electronics in Balvanyos between 25-28 July 2017. Balvanyos, a geographically unique and vibrant resort in the heart of Transylvania’s Eastern Carpathian Mountains, is waiting to enchant you with its breathtaking landscapes. The resort is also known for Lake Saint Ana, the only volcanic lake in Romania. Attendees will have the chance to experience the mystery of the lake’s legend, from which its name derives. Our aim is to bring together MSc and PhD students, as well as postdoctoral fellows carrying out research in the field of optics and photonics in Romania, Ukraine and the world, thus providing the environment required for sharing and promoting their scientific results and exchanging ideas whilst facilitating networking with their peers, young and senior scientists. We scheduled student technical talks and poster presentations, lectures of distinguished plenary and invited speakers, professional development, student chapter management, outreach as well as social activities. We hope that you will find all the required information on this website. Otherwise, contact us at ionsbalvanyos@inflpr.ro and we will be glad to help. We are proud to host the next European IONS® in Balvanyos, and promise a memorable conference with high quality scientific program, opportunities to meet and discuss, as well as a truly enjoyable woodland experience. Therefore, we warmly invite you to participate at IONS® Balvanyos 2017! Header photo captured by Silviu Hudini. Conference logo designed by Hunor Oláh.